Ever think about signing your little ones up for a music and movement class? tuneBugz is hosting a free sample week of Music Together® classes so the timing is perfect to check it out! You and your little ones can sing, dance and play at a tuneBugz! class. Free Demo Week takes places from Dec. 2-7 at locations all over town. Scroll below to learn more and sign up for a session! tuneBugz! teaches the Music Together approach in which children can learn to sing in tune, keep a beat, and enjoy music in a fun, group environment packed with lots of exciting instruments & props. Children also get the freedom to choose their participation level — so no need to worry about those wiggly new crawlers or walkers who love to explore the room. This Winter your family will learn twenty-five beloved Music Together songs and activities that are easy learn and fun to recreate at home. Whether you’re playing with an asymmetric meter song like Jim Jam Drumming or celebrating Hispanic culture with the classic lullaby Arrorró, mi niño – you’ll be building a community of support for your child’s musical growth. –> Free Sample Classes: The best way to know if the Music Together program is a good fit for you is to head in during demo week and try out the mixed-age classes for yourself! Click here to RSVP for a free demo class from Dec. 2-7. Winter Semester at tuneBugz! will run 10 weeks, from Dec 9th to Feb 28th. Winter tuition and fees: $260 (1st child) / $160 (sib), plus $15 non-refundable registration fee for families new to the Music Together program. Winter semester will feature the Drum collection of songs for Mixed-ages and Babies class the Tree Frog collection will be featured for Rhythm Kids. Mixed-age class (0-5) – This parent/child, family style class is terrific for infants, babies, toddlers & pre-schoolers and the grown-ups who love them. Mixed-age classes are research-based activities through a mixture of guided and free play. Activities, instruments and movement props are fun, developmentally appropriate and children in our classes thrive on hands on experimentation. Parents and caregivers play a critical role as they sing, dance, play and bond with their child through music. Babies Class (Birth to 6 months only) – This one-time intro to Music Together is for infants aged birth through 6 months and their favorite grown up (Mom, Dad, Nanny or Grandparent!) In this gentle class for babies the music, activities and materials are focused on supporting musicality in babies during the first 6 months of life. This class prepares parents with a deep understanding of the Music Together program and delves deeply into all the developmentally appropriate ways to support your musical child – starting in infancy! This is a very special educational time for parents and a loving and joyful experience for babies. 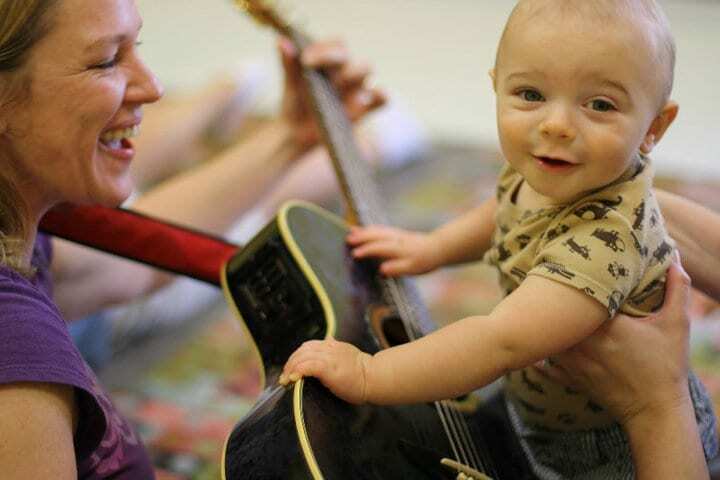 Parents with babies 6 months and under have 2 choices for music class – you can join the 1-time intro babies class OR jump right into the mixed-age class (both are age appropriate for infants). –> Learn More & Register Online: You can learn much more by visiting the tuneBugz! website and Facebook page. Click here to register for a class online. The North Pole Flyer: Train Ride with Santa!